Is the actress returning to her former home network? Claudine Barretto seems to have finally reconciled with one of the Tulfo Brothers. 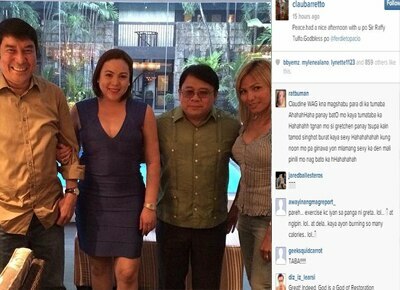 In an Instagram post of the actress on May 22, Claudine was in a photo with her lawyer Atty. Ferdinand Topacio, Raffy Tulfo and an unidentified woman. "Peace. had a nice afternoon with u po Sir Raffy Tulfo.Godbless po @ferdietopacio," the former Kapamilya actress said in the photo’s caption. Claudine and her now estranged husband Raymart Santiago had a brawl with Raffy's brother Ramon back in 2012 at Ninoy Aquino International Airport. A video surfaced online that year showing the controversial scuffle. Subsequently, Raffy alongside his brother Erwin aired their sentiments about the incident on their TV show and threatened Claudine and Raymart with harm, which lead to the suspension of the Tulfo Brothers' show for a while. Both parties have filed cases against each other in court. Instagram users expressed their delight over the said "reconciliation". "Healing starts with forgiveness, lots of it. 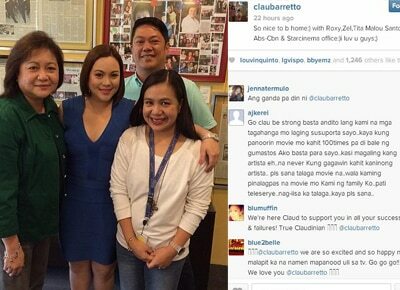 This is a start, @claubarretto I am one happy 'fan' to see this unfolding. You hold on to your faith, and do not let go. Be the better version of YOU! It is time to SHINE, once again! Love you Claudine!!" Instagram user @blumuffin commented. "That's good Clau it's good to have peace in your heart and mind," @thessreal posted. On the same day, May 22, Claudine also posted a photo of her with Star Cinema's Managing Director Malou Santos, Ad Prom Head Roxy Liquigan and producer Zel Martinez. "So nice to b home:) with Roxy, Zel, Tita Malou Santos @ Abs-Cbn & Starcinema office:)i luv u guys;).” Claudine captioned. Though she is yet to confirm if she will be doing a project with the film outfit, Claudine's fans rejoiced online because of the sighting. "@claubarretto we are so excited and so happy na malapit ka na namen mapanood uli sa tv. Go go go!! We love you @claubarretto," blue2belle commented. "Yay, so excited to watch you again in a big screen clau," @samli1981 posted. "Whatever comes after this, @claubarretto , we are all here," @claudinesloves2 stated.